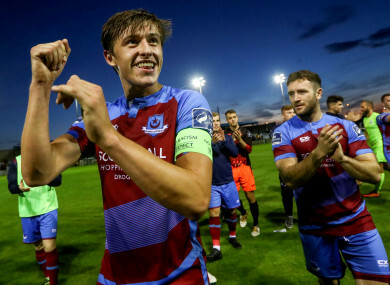 Drogheda United captain Jake Hyland celebrates after the game. SHAMROCK ROVERS’ SEARCH for a first FAI Cup since 1987 will continue into another season after the Hoops suffered a 1-0 defeat to First Division Drogheda United. Chris Lyons’ 24 minute penalty was enough for Tim Clancy’s side to book their place in the second round, as the record holders exit at the first hurdle. Friday was a more positive night for their Dublin rivals as there were opening round wins for both Bohemians and St Patrick’s Athletic. The Gypsies easily dispatched Wexford Youths 7-0 thanks to goals from JJ Lunney, a brace from Dinny Corcoran, Daniel Kelly, Keith Ward, Eoghan Stokes and Cristian Magerusan. St Pats’ came out on top in a south Dublin derby, beating Inchicore Athletic 5-0 at Richmond Park. Darragh Markey got the Saints up and running ten minutes after half-time, with the visitors having to play virutally the entire second half with 10 men. Leon Fahey Byrne was shown a second yellow card 30 seconds after the interval, with Liam Buckley’s side extending their lead thereafter. Jake Keegan made it 2-0 after 76 minutes, with Conan Byrne, another from striker Keegan and a fifth from Simon Madden making it a comfortable evening. Elsehwhere First Division leaders UCD saw off Pike Rovers thanks to goals from Timmy Molloy and Conor Davies, while Shelbourne eased past bottom of the table Athlone. Patrick Kavanagh, Greg Moorehouse and Lorcan Fitzgerald were all amongst the goals for the Reds, on top of an own goal from Nika Kalandarishvilli. Finn Harps, too, will have their name in the hat for the next round following a dramatic extra-time win away to Bray Wanderers. Ollie Horgan’s side went a goal behind at the Carlisle Grounds thanks to Ger Pender’s strike after 15 minutes, before an equaliser Sam Todd forced another 30 minutes in Wicklow. Michael Place put the Ballybofey club ahead for the very first time seven minutes into extra-time, with Jacob Borg making sure of the win with eight minutes left on the clock. Email “FAI Cup wins for St Pat's and Bohemians while Hoops' 31-year search continues after early exit”. Feedback on “FAI Cup wins for St Pat's and Bohemians while Hoops' 31-year search continues after early exit”.